As regular readers of this blog ought to know, I haven't counted myself a fan, let alone a player, of D&D III for many years now. Indeed, it was my dissatisfaction with that game that brought me back to the games I played in my youth and that I'm playing today. Consequently, I haven't been keeping a close eye on events in the D20 world; it's generally only when someone brings one of its products to my attention that I take notice. 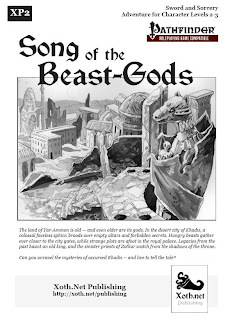 It's rare still that I find myself enjoying a D20 product enough that I wish there were some way I could work it into my OD&D campaign -- but that's exactly how I felt after I read Morten Braten's adventure, Song of the Beast-Gods. This should come as no surprise, since I'd already read and enjoyed Braten's previous adventure The Spider-God's Bride, which, like the present one, is written for the D20 system and set in a fantasy world called Xoth. Xoth is a fascinating setting, calling to mind both Howard's Hyborian Age and Clark Ashton Smith's Zothique, suffused with hints of eldritch horror. It's almost tailor-made for the kinds of pulp fantasy adventures I most enjoy. This fact probably goes a long way toward explaining why I found it easy to overlook the D20 stat blocks and related mechanics and see Song of the Beast-Gods for what it is: a fun sword-and-sorcery adventure for characters of 2nd to 3rd levels. Before discussing the contents of this adventure, allow me to briefly discuss its appearance and presentation. Like its predecessor, Song of the Beast-Gods uses a two-column layout for its dense text. I occasionally found it slightly hard to read, but that probably says more about my aging eyes than the layout itself. Maps, important details, and notes to the referee are highlighted through the use of boxes. Titles and headers use evocative -- but legible -- fonts that contribute greatly to the pulp fantasy feel of the adventure, as does the artwork, which is a mix of original pieces and public domain engravings. All in all, Song of the Beast-Gods is attractive and well put together, something I find particularly impressive because it's the product of a one-man operation, with Braten acting as writer, cartographer, and graphic designer. It's difficult to say more about the adventure without spoiling its secrets. Suffice it to say that events two decades ago did not go quite the way that history records them. This provides an opening for the PCs to become enmeshed in several plots within the city of Khadis that have far-ranging repercussions. What I most liked about Song of the Beast-Gods was that it is, at its heart, a location-based adventure. Certainly, there are plots, but these plots are the plans of various people seeking to take advantage of the situation in Khadis rather than a foreordained sequence of events the referee is expected to follow. Thus, there are no pre-arranged "scenes" or lengthy sections of boxed text to be read as long-winded NPCs try to involve the PCs in their schemes. Instead, what we get are situations, along with detailed descriptions of adventuring locales -- the city, the royal palace, dungeons -- and it's up to the players and referee to use those things to craft an adventure of their own. For this reason, I think it'd be quite easy to ignore even the situations described in the adventure and simply use its maps, locales, and new monsters on their own. Of course, doing so would deprive one of what I think is a terrific scenario filled with both exuberant sword-and-sorcery excitement and the potential for further developing the fallout from the events the PCs set in motion. 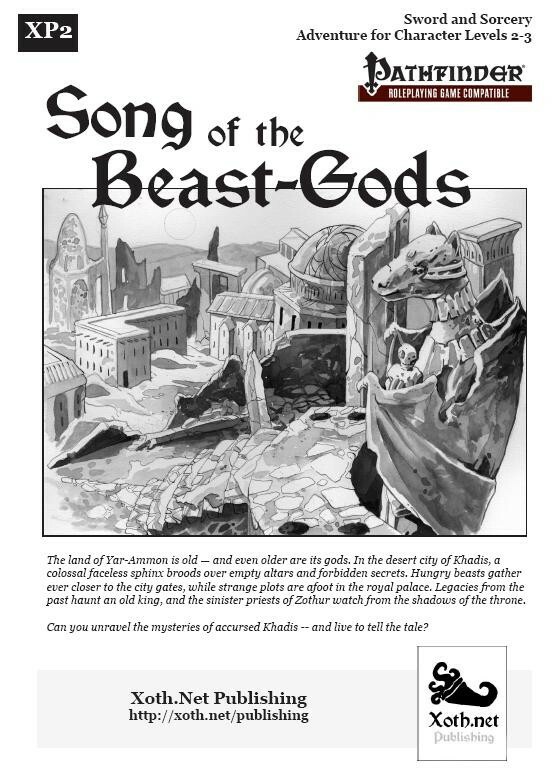 Song of the Beast-Gods is the kind of adventure that could easily kick off an entire campaign and a pretty interesting one at that. That alone makes it worth the $5 cost of the PDF ($12 for print). My only real qualm in recommending this adventure is that it's not specifically written for older versions of D&D and thus using it will require a certain amount of conversion but nothing too onerous. In the end, it's Morten Braten's ideas that are this product's main selling point and they're very compelling if, like me, you prefer your fantasy with a healthy dose of pulp. Buy This If: You're looking for a well-done, low-level sword-and-sorcery adventure and don't mind doing a little conversion work. Don't Buy This If: You either have no interest in sword-and-sorcery or are unwilling to convert D20 mechanics to your preferred system. What with basic D&D and its clones, AD&D and its clones and d20 and its clones--plus all the great material in not-D&D-derived systems--is there any GM who thinks they're worthy of the name who hasn't developed the skill of doing conversions in their head in seconds? Is system a barrier for anybody out there? I mean, -style- is, sure, there are styles of adventure that are characteristic of various eras of RPG I don't care about--but does the system the stats are written -alone- in ever stop anybody? I once had the idea of running a Pathfinder adventure under Labyrinth Lord. I'm no expert with either system, but I found the conversion to be quite easy; the reason I didn't run it in the end was that reading through the adventure, I realised it wasn't very good! I think it depends on how different is the system. There are some games, for which the assumed "power level" is difficult to ascertain if you are not intimately familiar with the game; just to name two games: Warhammer FRP and Lejendary Adventure. OTOH I don't expect much difficulty in handling a conversion between all iterations of D&D, with the possible hiccup of having to cut (a lot) when "downgrading" to a very simple system like LL. As long as you know the "power level" of the system you're converting to, it's not an issue. I'm going to transform the thing, to a greater or lesser extent, anyway. I don't need to know the "host system" at all, to utilize the ideas as I see fit, with whatever system I choose. "Is system a barrier for anybody out there?...does the system the stats are written -alone- in ever stop anybody?" I don't like to pay for things I don't want. So, if too much of something is other-system stuff that I don't want, then I won't buy it and, so, won't use it. But, so far, that's kept me from using only 'crunch'-heavy products for rules-heavy systems. Zak S said: "Is system a barrier for anybody out there?" Yes. Partly it depends on your taste for fidelity in the underlying simulation -- if you expect that to be semi-fine-tuned by the author, and the product does not provide such, then that may not be a product you care for. Or I may not want to deal with the visual clutter and difficult layout of extensive stat blocks that I'm not using. Or it may stumble over plot-important changes in mechanics: for example, whether spells like charm person, polymorph, and invisibility are permanent (or long-lasting) in one system, but not in another. Thulsa keeps to the d20 System because its still a popular system, and he is from the old Mongoose Conan crowd (I'm also from the same circle). Like with Dungeon Crawl Classic, converting a 3.x/PF game into an old-school game should not be too difficult, as you mostly have to scale down stats (using just HD, AC, and the like), or use the appropriate old-school equivalent (you can ether convert the Pirates' stats, or you can look-up "Man" in the ol' MM). I do this often. Beyond the books mention above, he has also produced some interesting hybrids of old D&D modules and Conan adventures. For example, his HD2: The Shrine of the Black Ones module is a mix of D2: Shrine of the Kuo-Toa and REH's Pool of the Black One. Not everyone would appreciate them, but I find them to be a fresh take on some classic adventures. "I may not want to deal with the visual clutter and difficult layout of extensive stat blocks that I'm not using." That very reason was why, after acquiring and reading them, I ultimately decided not to use the d20 versions of Dark Tower, Caverns of Thracia and City-State of the Invincible Overlord. Despite how otherwise excellent they are, I just don't feel like picking their excellence out from amidst all their extraneous d20 crap. Luckily, though, my sister-in-law plays 3.5, but wants to start playing it in an old-school, location-based way. So I gave them to her. I've taken DCCs and a notebook and converted them over to Tunnels & Trolls. Going from one edition of D&D to another would be MUCH easier, especially going from 3 or 4 to an earlier one. It might not be perfect and some DM fiddling to get the right level of challenge, but its not THAT complicated. Heck, WOTC made a conversion booklet for 2nd to 3rd just before it came out that would give a fair ish guideline to backport. is there any GM who thinks they're worthy of the name who hasn't developed the skill of doing conversions in their head in seconds? If you want to convert anything from D20/PFRPG to AD&D, Moldvay D&D, OD&D/Holmes or even T&T, it's very easy. But it's not to convert materials the other way round since you have to take into account the whole balance and challenge issue and to skip the entire skill system - that's a lot of impro or prep, if you prep, and given this lot, you might as well design or impro your own. And yes, there's a system that's a barrier, Zak: the 4th - exactly like WFRP, Antonio. More to discuss if you or anyone disagrees. Captain Rufus said: "Heck, WOTC made a conversion booklet for 2nd to 3rd just before it came out that would give a fair ish guideline to backport." "Are there any conversion plans in place for transitioning 3.5 to 4th Edition? We learned with 3rd Edition that accurate conversion really doesn't work. Thus, we're encouraging everyone to start at 1st level in 4th Edition and learn the new system from the ground up. While you'll certainly be able to reinvent many existing characters with the new system, there's no conversion guide that could adequately cover the vast array of options that have been published over the lifespan of the game." I suppose the keyword here is "accurate." Obviously you cannot get an "accurate" conversion between two systems. It doesn't work not even with B/X to/from AD&D which share the same root. For what is worth, I used the 2nd->3rd conversion booklet to get reasonably good conversions of character concepts, and in terms of power levels. And the difference between 2nd and 3rd is definitely smaller than the one between 3rd and 4th.